Eliminates unpleasant odors, difficult and persistent. Effective against musty smells, smoke, garbage, sewage and similar. Indicated as post-cleaning booster. Eliminates unpleasant odors, difficult and persistent. Deodorises effectively and safely. Prevents unpleasant odours which cause inconveniences. 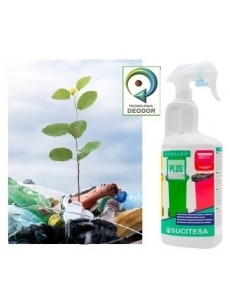 Incorporates DEODOR Technology. Encapsulates and neutralizes offensive odors, making them undetectable. Effective against musty smells, smoke, garbage, sewage and similar. Indicated as post-cleaning booster. Broad spectrum of action. unpleasant odours accumulate. Waste bins. Drains and wastepipes. Food industry. Healthcare centres. Shopping centres. ENVIRONMENT. Spray upwards in all directions. SURFACES. Spray the product on the surface.